San Francisco has hit the mid-point for its one-year electric scooter pilot program. In a slide deck to be presented at the San Francisco Municipal Transportation Agency’s board of directors meeting tomorrow, the SFMTA reports that there were 242,398 electric scooter trips between October 2018 and February 2019. What especially jumps out is the fact that Skip accounted for 90 percent of all rides. 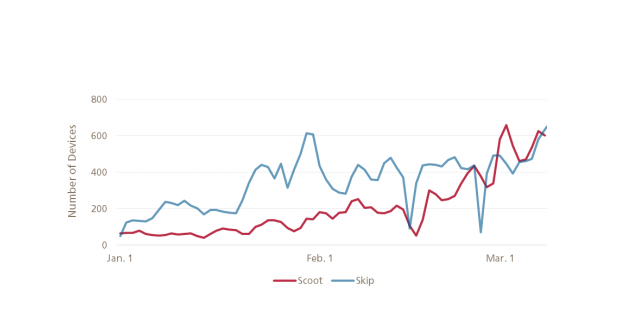 It seems that’s a result of consistently having more scooter availability than its rival, Scoot. On the flip side, Skip’s high number of devices and 218,000 trips made resulted in 34 collisions — 18 of which caused injuries. Scoot riders experienced zero reported collisions. Some of the promises related to electric scooter usage have touched on fewer car trips and better access to transportation for people in low-income areas. The SFMTA says 42 percent of scooter trips replaced car trips, while just 0.5 percent of Scoot trips and 0.3 percent of Skip trips were part of the low-income program. Oh, and here’s the real shocker (sarcasm): 63 percent of riders are white and 82 percent are dudes. Meanwhile, 68 percent of the riders have household incomes of more than $100,000, according to rider surveys. In San Francisco, 53 percent of the population is white and 51 percent are male, according to the U.S. Census Bureau. In conclusion, the SFMTA says lock-to mechanisms have improved parking compliance, but that more scooters are needed to more thoroughly evaluate the program. Additionally, scooter companies need to do more outreach in underrepresented communities. Moving forward, the SFMTA will decide this week whether to allow Skip and Scoot to increase their respective fleet sizes, as well as consider allowing operators like JUMP, Spin, Lime and Bird to deploy their own fleets.